In 1994, the young director Quentin Tarantion hit it big with his second movie Pulp Fiction. Well, technically he'd hit it semi-bit with Reservoir Dogs two years earlier, but once Pulp Fiction was on the big screen, everyone knew his name. The film also resurrected John Travolta, and for many of us, it is certainly his finest role. Here's a guy with more lives than your average cat. He's a mega-star back in the days of Saturday Night Fever, fades into obscurity, comes back into the limelight with Look Who's Talking, again manages to fade away, gets resurrected as a mega-star with Pulp Fiction, and yet has somehow managed to bury himself in bad films again. This guy's career goes up and down more than his weight. 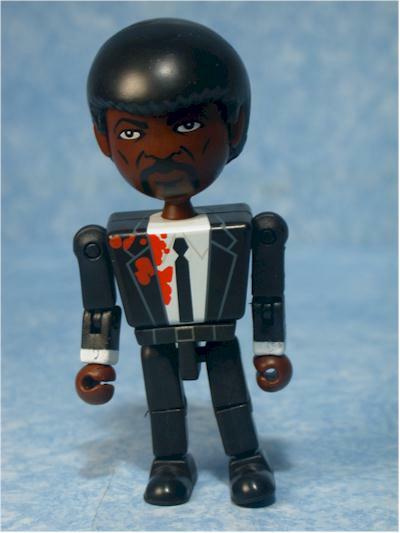 NECA brings us their first series of GeOms based on Pulp Fiction. What are GeOms? 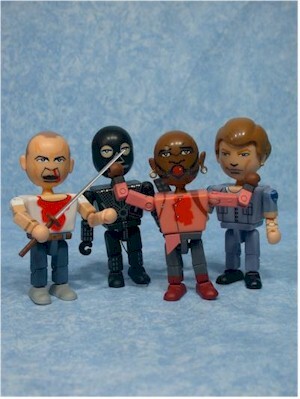 NECA's version of mini-figures, of course! 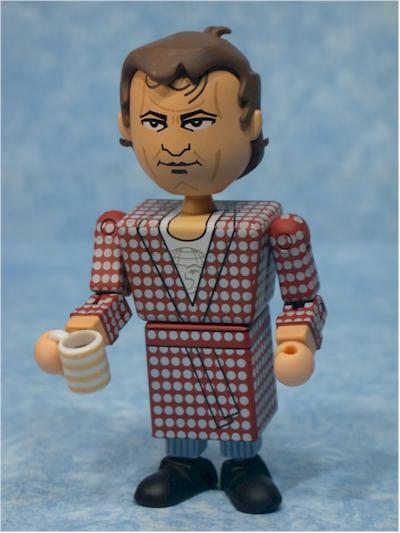 Mini-figures are to toy companies what pet rocks were to kids in the 70's - everyone has to have one. 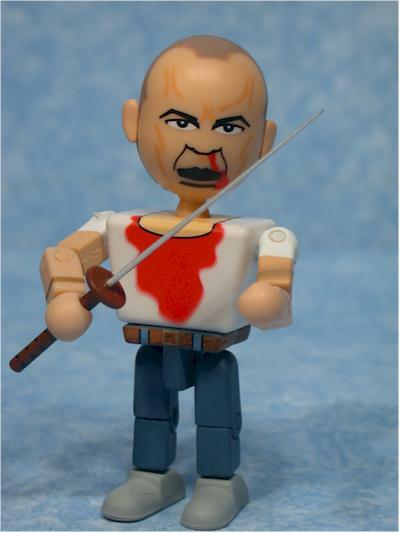 With round heads, sculpted hair, painted faces and squarish bodies and limbs, they are similar to other mini-figures, yet have their own twists. 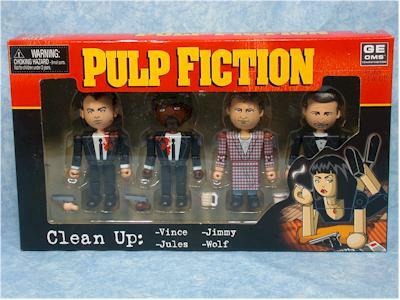 The Pulp Fiction line includes four sets of four figures each - the Cast, Overdose, The Gimp, and Clean Up. I reviewed The Cast and Overdose over at Poop Shoot this week, and tonight I'll review Clean Up (with Vince, Jules, Jimmie and The Wolf) and The Gimp (with the Gimp, Zed, Marsellus and Butch) here. The figures retail for around $20 for a set of four, although you can find them at some on-line retailers for closer to $16. I picked mine up through Killer Toys, where they are $16 a set and in stock. Each set comes in a sturdy box with die cut window showing off the figures. The graphics are solid, although the same across all four sets. A little variety in that department would have gone a long way. The text varies for each box, telling you the specific characters inside, but oddly, they've spelled 'Jimmie' with a 'y', instead of an 'ie'. The film credits have it as 'ie'. The boxes are collector friendly as well, and you can easily remove them and put them back later. No twisty ties! A special note when taking them out of the package - be careful! The ears can get stuck in the bubble, and get pulled off if you aren't gentle. Mini-figures and sculpting don't often go hand in hand, but here there's some details added. Each of the figures has sculpted hair (except for the bald guys of course) and ears, along with some extra touches like shirt corners and earrings. The sculpts on these two sets don't get quite as high of marks as the other two sets (see aforementioned review at MPS) on two counts. First, the Clean Up versions of Vince and Jules are identical head sculpts to the Cast versions. And second, while there's a couple extra touches, there aren't as many as in the other two sets. Rather than having the shirt corner that's hanging out sculpted on Marsellus, I would have preferred that painted and the ball in his mouth sculpted. Ah well, you can't have everything! One extra these do have that's well worth mentioning is the Gimp's 'lease'. There's a string running out from the top of his chest, and that was an addition that really was a nice surprise. These stand out overall in the sculpt category from most mini-figures. The only ones with more sculpting are Mez-itz, and there are plenty with less. The paint ops are excellent all around. Everything is clean and neat, and there's a tremendous amount of small detail work. Most of the faces look great (although Harvey and Quentin aren't quite as recognizable), and in these sets they've added plenty of blood where appropriate. Characters like Butch and Marsellus in the Gimp set, or Vince and Jules in the Clean Up set, have blood splatterings and soakings. The small details can be easy to overlook, but when you really pay attention, they add an extra degree of cool. 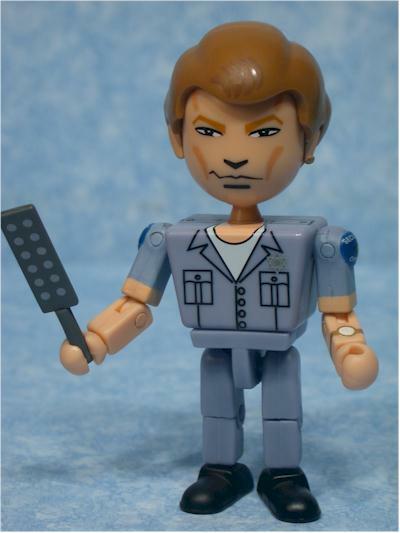 The pattern on Jimmie's shirt, the writing on Zed's badge, the blood from Butch's nose and mouth - these kind of extras really add a lot to your appreciation of the figures. The figures are nicely articulated, with a similar number of points to other mini-figures. There's ball jointed necks, shoulders, elbows, wrists, waist, hips, knees and ankles. Jimmie's robe restricts the usefulness of his leg articulation, but that's to be expected. It's a little tricky to get them to stand, because of the huge noggin's they have, but the joints are tight enough to hold them up in the major poses. Some of the pieces pop off, like the hands, heads, legs and forearms. Swapping around parts doesn't make quite as much sense though as it might in other licenses. Like the sculpting, the accessories score is a little lower with these two sets due to some re-use, and overall fewer accessories. In the Clean Up set, Vince and Jules come with their extra hands and guns again. Both Jimmie and The Wolf have coffee cups, with slightly different paint jobs. Check out the brown coffee inside the cups! Everything fits nicely in their hands. 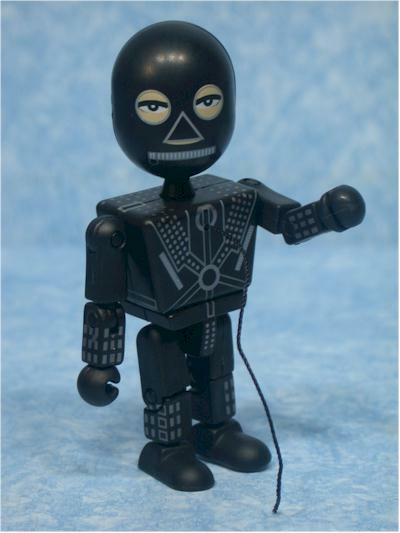 In the Gimp set, Butch has the sword, and Zed (or the Gimp) have the paddle. These also fit nicely in their hands. 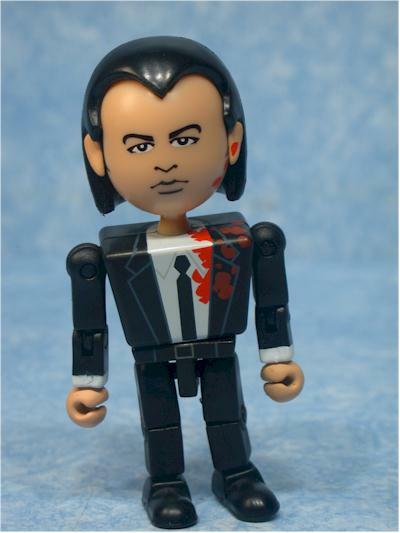 These aren't intended as finely sculpted, exacting collectibles based on the film Pulp Fiction. 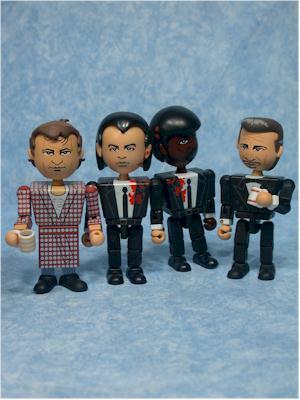 They're toys based on Pulp Fiction, and as such, they're a lot of fun. This is one of those rare times when the figures will get a high fun factor, yet I don't see many kids liking the license. But for those of us who are really just big kids anyway, these can provide hours of amusement. 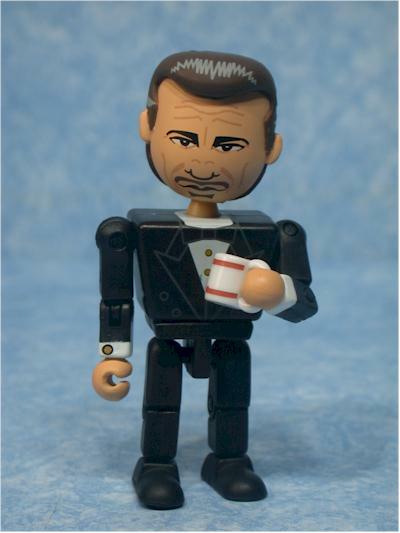 Mini-figures are getting way too expensive. Palisades has announced their 'palz' are going to cost $8 each, and most others are now up to $5 each. That's simply too much for this small format, but the continued dearth of retailers means production runs on all this stuff is lower than ever. These are running about $20 a set, or $5 each. Get them down around $4, and you can add another half star to the value score. 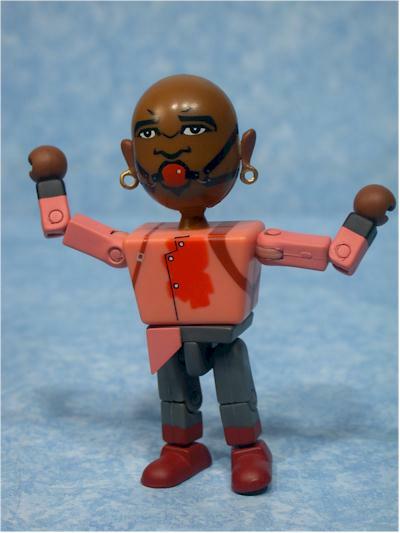 There are two types of action figure collectors - those that love action figures because they are toys, and those that love action figures because of the property they represent. Mini-figures appeal to the folks who are in both camps, those of us that fit into the intersection of these two groups. 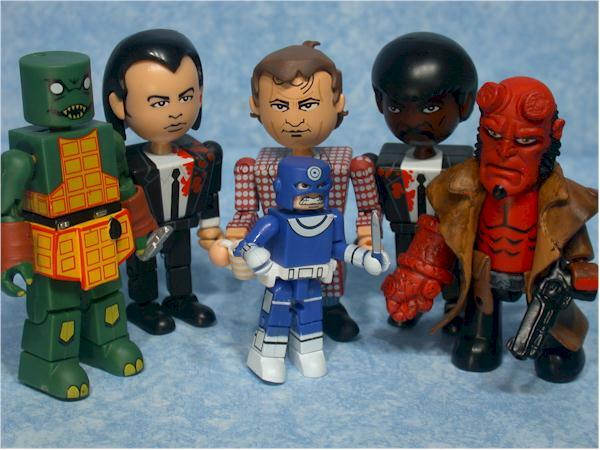 If you like mini-figures, than these are well worth checking out. The style and design are solid, and the sculpted hair and extras give them an added boost. I certainly do wish they were cheaper, but the economy just isn't supporting it right now. I picked mine up at Killer Toys, and they have all four sets for just $16 each. At that price, you can add another half star to the value score. KEEP SCROLLING DOWN FOR LOTS MORE PHOTOS!